Hi all, the February 2018 GSM this past weekend has concluded. Once again the public portion was streamed on Frumple’s Twitch channel, and a recording of this is available here. In response to the changing community, the original rule banning any sexually suggestive builds has been lightened, which now reads “No sexually explicit builds and comments in public chat channels“. The key difference here is that while slightly suggestive comments or builds are fine, you should avoid anything that could be considered crude. In addition, a change in policy has been introduced for Senator, Governor and Premier promotions, whereby the time restriction of 4 weeks for Senator and Governor, and 8 weeks for Premier has been lifted. MRT v5.1, which is an improvement to the existing stations’ Departure Bays & Cart Loaders designed by godzilltrain and Lalaboy has been approved, and will be rolled out in the coming weeks across all MRT lines. The Southern East line was proposed by godzilltrain and has been approved following the route shown above. A Google Form for signing up for stations will be provided later. Please note that the founding of any new towns along any extension route is prohibited until the extension is complete and the station has been assigned to a player. 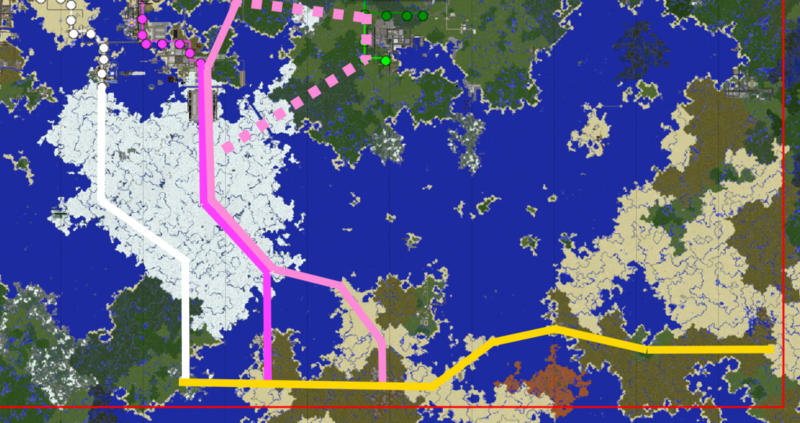 The northern part of the Jungle line was proposed by AP_Red and has been approved following the route shown above. A Google Form for signing up for stations will be provided later. Please note that the founding of any new towns along any extension route is prohibited until the extension is complete and the station has been assigned to a player. A proposal by LithiumMirnurix to build the A59 has been denied as it is too ambitious, and it is unclear whether permission has been granted by nearby town owners. denied as permission had not yet been granted from the nearby town of Kolpino City. A proposal by Just_Robinho to build the B45 connecting from Lakeview to Bronte, as well as extending the A4 from Marblegate along the Forest Line has been approved. A funding request by Airplane320 for prizes for the Olympic Games, a twice-annual event, has been approved. A request by Talonplays to organise a MiniGolf tournament has been denied as the project, which would have involved three large tournaments, is very ambitious. We have instead requested that Talonplays submits a request to fund just a single tournament, and depending on the outcome of this we will consider funding more in the future. A request by LDShadowLord to fund the Evella Expo 2018 has been partially approved. LDShadowLord had originally asked for the server to cover both the prize money, as well as $150 for his time spent organising the event; however as he plans on charging for booths, we have only agreed to cover the costs of the prizes. A proposal by mine_man_ to start drawing B-roads on Dynmap, in addition to the A-roads of which some have already been drawn, has been approved. These will be drawn in the coming months. A proposal by DevranTheBoyxD to move the MRT Station ZN30 underground through his town has been denied. We would be willing to reconsider this proposal once his town is larger. A request by Fifi_2 to take over the station T50/NW26 has been approved. A request by Jian_Zen to take over F31Saint Petersburg has been denied for now as his town is still a good distance away from the town. It was decided however that the station would be reserved for Jian_Zen if he were to expand closer in the future. A request by Aldranster50 to take over the town around V21 has been denied for now as his town is still a good distance away from the town. It was decided however that the station would be reserved for Aldranster if he were to expand closer in the future. A request by LithiumMirnurix to claim the area of Vietta Islands has been denied as he needs to show evidence that he can successfully build a town himself first. A request by ArdyArd to take over the company ChimeRail has been approved. 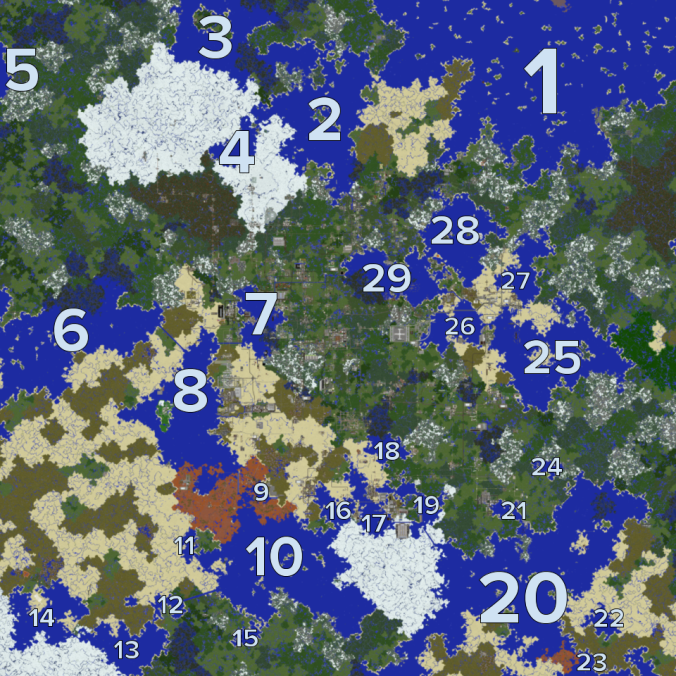 A request by BernCow to take over the town around ZS25 has been approved. CRPB 21 Results and Western Line Claims Open! Feedback to all candidates is available here, as always. We’re excited to start reviewing the cities of CRPB 22! If you’d like to be considered for CRPB 23 for promotion on April 1, please fill out the CRPB request form by March 1. Premier cities will next be reviewed at the Heart-Shaped GSM on February 17; those submissions are due via the CRPB form on Thursday, February 15 at 7:00 pm UTC. I’ve been working on the WLN (Western Line North) over the past few weeks and will get another chunk done this upcoming weekend. The line will open on February 17, immediately after the GSM. As of this posting, stations WS1, W0, and WN1-WN18 are installed and ready to go. Stations WS1, WN5-WN7, WN19-WN24, and WN26-WN30 are available for requests, and WN30 and WN22 carry inactive town auctions. Request your Western Line station here! 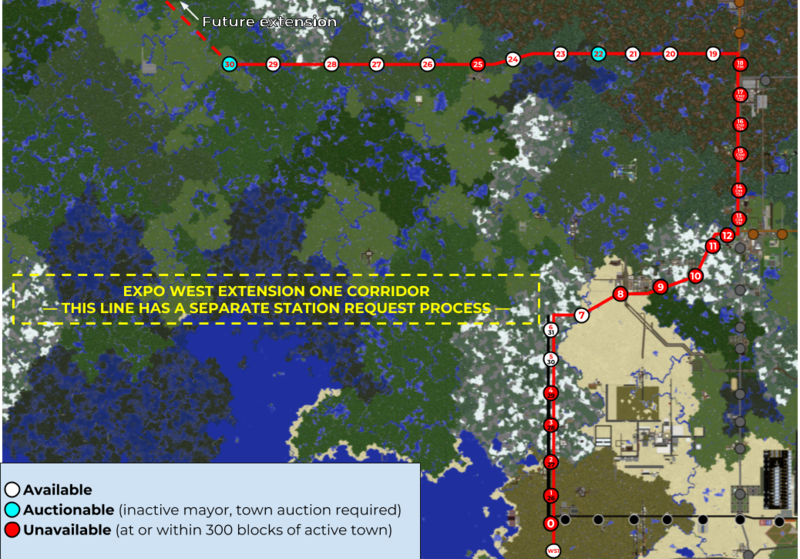 Note that, with the exception of WN5 and WN6, this process is independent of the Expo West extension. mikefishr is working on that project and we will provide updates as soon as they are available. As WLN station requests will be approved at the GSM, these requests are due Thursday, February 15 at 7:00 pm UTC. We’re excited to open the next MRT line in just a couple weeks!